OshKosh B'gosh is having a special promotion on right now where you can save an additional up to 20% off your purchase. It is very simple, print a special coupon and take 20% off your purchase of $40 or more. Or, take 15% off your entire purchase! Do not hesitate and go shopping, but don’t forget to print the coupon and bring it to your nearest store location. Source of the information is OshKosh B'gosh. Offer is valid through April 3,2016. 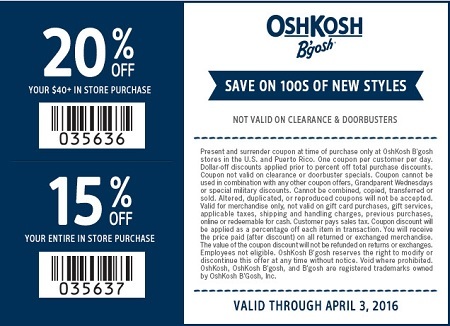 For more details about this promotion visit your nearest OshKosh B'gosh store location in the U.S.